Many people complain that their e-book readers cannot be used for browsing the Internet or checking email. Others are happy with their tablet but claim it lets them down in terms of raw reading experience. As the saying goes, you can’t please all of the people all of the time. 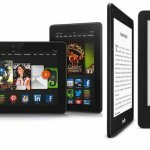 Amazon initially named both their e-readers and tablets Kindle, although that has changed now. After the first 2 generations of Kindle Fire, Fire lost the Kindle prefix as it gained in other areas. 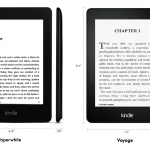 Kindle Paperwhite, Kindle Voyage and the original Kindle are all e-book readers. Kindle Fire HD, Fire HD6, Fire HD 7 or Fire HD Kids Edition are multipurpose tablets. Today’s article will help you determine which to pick according to your needs without getting overwhelmed. An e-book reader like the pure Kindle range is expressly designed to give you the most pleasurable and convenient way of enjoying your books. Its basic functionality is to enhance your reading experience. You can browse for books, magazines or comics, and download them to enjoy later. Almost all features on an e-reader help enhance the reading experience. Whether it’s explaining terms or streamlining search, everything is done with reading in mind. Some e-book readers now also pack audio capability if you prefer being read to. As an added bonus, you can carry your whole library with you at all times. , on the other hand, is like a mini computer. You can do almost everything on the tablet that you can with your laptop except type rapidly. Even this can be overcome with an external keyboard. A tablet is a true entertainment hub. You can play games or watch videos, send email or browse the web. You’ll also be able to read on it. It’s straight up reading on an e-reader versus reading and a raft of other functionality with a tablet. Most e-book readers have 6-inch screens and are highly portable. E-readers are as light as a paper-book so you can use them for prolonged periods in one position and with one hand without fatigue setting in. A tablet, on the other hand, is normally bigger and heavier. The larger display makes watching movies or playing games more pleasurable. If you want the best of both worlds, you can always opt for a smaller tablet. There’s always some degree of compromise involved but this allows you to get the advantages of an e-reader’s size without sacrificing that extra functionality. The battery life on an e-book reader is measured in weeks rather than hours like most of our tablets, phones, and computers. For pure and extended reading without charging, an e-reader wins out. The battery on a tablet drains more rapidly depending on how many apps you run in the background or what else you are doing. That said, tablets can generally get through the day without sending you scurrying for your charger. Since an e-book reader is focused primarily on reading with little or no additional features, it’s not surprising they are cheaper. 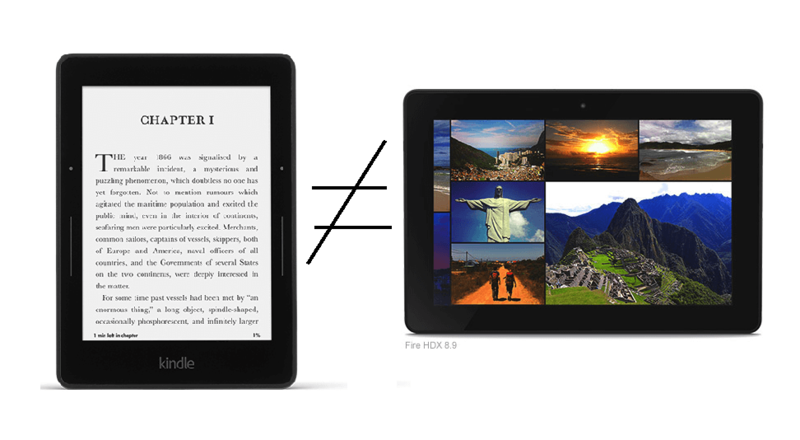 This is one of the key differences between an e-book reader and a tablet. The screen of the e-book reader is developed using E Ink technology. Reading on an E Ink screen is the closest you can get to reading on paper without hurting your eyes. You can also read it in broad sunlight without any glare. Tablets have LCD screens. These sharp, color filled, and back-lit. That said, they are also highly reflective meaning they don’t’ work effectively outside. This niggle aside, the screen on a tablet is much more responsive to touch. How much reading will you really be doing? If you really want to cultivate the habit of reading without any distraction from emails, push notifications, or the Internet in general, go for the exclusive e-book reader. will be the best decision you made in a long time! Come back soon for more reading-related news and reviews. Last updated by Sarah Lewinsky at February 14, 2018 . 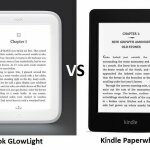 Kindle Voyage vs Kindle Paperwhite: Which one to Pick? Thank you! Was considering replacing a lost Kindle e Reader with a Fire table and your article clearly states the differences. Get on our newsletter and we`ll update you with the best readers and accessories on the market every week. 100% Spam Free – Just the Goodies.